Approximately, eight years ago, I first stumbled across William G. Tapply’s, Sportsmen’s Legacy, at my local library. 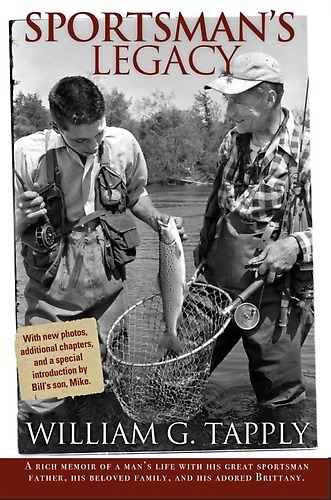 From the cover, I could tell it was a memoire of a father and a son who spent time together in the outdoors. At the time, this seemed like the kind of book I’d be interested in as my own father fostered my love of hunting and fishing and I am trying to instill this love in my own children. So the theme alone piqued my interest. To my surprise, this book opened up for me a whole new world of outdoor writers from the very golden age of outdoor literature including, Burton Spiller, Corey Ford, and Gorham Cross (“Grandpa Grouse”), and the author’s own father, Horace G. Tapply (or just “Tap” to his friends), who was the editor of Field & Stream magazine. Save Tap only, most of these men had already passed away before I was even born. When he was young, Bill, along with his father, spent many days afield and on stream with these giants. In fact, Put Putnam nicknamed Bill, “Harm,” and jokingly suggested that they keep their fishing tackle “out of Harm’s Way.” For me, Bill Tapply was a living link to these men and his book caused me to search out and rediscover their writings, which is a tremendous legacy for us all. In the introduction to this new edition of the book, Bill’s son, Mike concludes by saying, “I hope fathers and sons and daughters alike enjoy these stories, and every so often, pick up on something between the lines.” For me, this simple statement captures the essence of this book. While the book has some great history and stories, the real legacy is the bond between a dad and a son, which was cemented by their partnership in the outdoors. Bill Tapply relates that Tap Tapply lost his own father during World War I. As a result of his loss and hard childhood, Tap developed the belief that life was “stern and earnest.” Notwithstanding this somewhat pessimistic outlook, Tap seemed to focus on the things that mattered most to him, which were first and foremost his family and his love of the outdoors. While Tap hunted and fished with the greats of his time, his favorite outdoor companion of all was his son, Bill. Together they embarked on little adventures, which they called “Ex-plores and Expotitions” (terms they gleaned from, Winnie the Pooh). This book is full of stories that any father and son who love the outdoors will enjoy. The new chapters in this edition are definitely a good addition to the book. Also, this edition is packed with new photography that help bring to life Bill’s great stories. Now that both Bill and Tap have departed this earthly existence, this book is a great tribute to their individual lives and also to the outdoor traditions that we treasure, which are all definitely a legacy to remember. I’m happy to have this book as part of my library and highly recommend it to the followers of Upland Ways. I too, enjoyed this book. Definitely harkens back to the good ol days New England sporting…. Thanks. I agree that this book relates back to the glory days of New England hunting and fishing and to the Golden Age of outdoor literature. It was a sad day when Bill Tapply passed away.